Bruce was the son of Annie E. Mooney and George McWilliam of Lot 8 Concession 14. He joined the Royal Canadian Air Force in 1941 and went overseas in 1943 where he served in England as an aircraft mechanic and ground crew with the 419 ‘Moose’ Squadron based in Middleton St. George, County Durham. While in England he married Frances Airey in 1945. In 1946 Bruce and Frances returned to Canada and Bruce resumed farming with his father. Together Bruce and Frances raised their three children - Joan, Mary and Paul. In later years Bruce also worked at the Casket Company in Ingersoll. 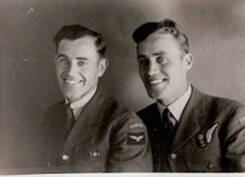 His brothers, Angus and Ross, also served in WW11.